Rusty Eye will officially release “Live at the Joint MMVI” on July 1st, 2006 at the downtown LA club “Little Pedro’s”. This live CD is the first of a series of releases this year and will be available on CD Baby next week. 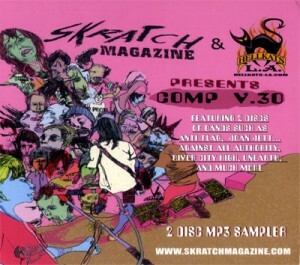 If you’re going to the Warped Tour don’t forget to pick up a copy of the Skratch Magazine Compilation V.30. Featuring 2 Discs with bands such as Anti-Flag, Joan Jett & The Blackhearts, Against All Authority, River City High, Unearth, and of course: Rusty Eye.